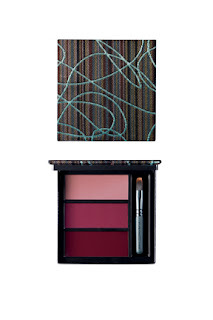 MAC launches Painterly eyeshadows and eye pencils , and in 3D lipgloss and lip pencils at counters Aug.2 They are up on the MAC website now. Painterly is a collection of Paint eyeshadows in a special formula to be long lasting. 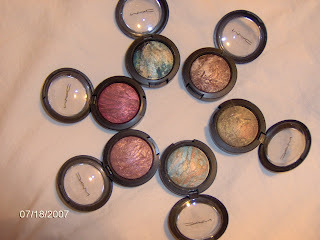 The original Paints are one of my favorite MAC items as they do last so well. The new glosses are extra shiney, pearly and balm like. a cream shadow and lasts for hours with no creasing, caking, or transfer. removed with M·A·C wipes. Dermatologist tested and Ophthalmologist tested. 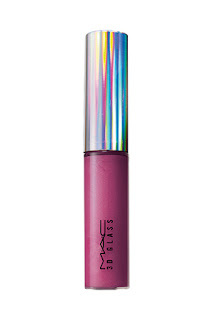 New smoothing cellophane lipgloss has immediate super shiny,long lasting finish. 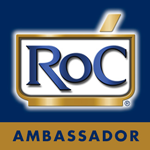 Has a comfortable lightweight balmy feel withaloe which helps soothe lips. The petrolatum provides cushion andcomfort and has a non sticky texture. A combination of Xirona pearls and extreme glass shine gives lips a three dimensional look. Lightweight oils with vitamin A, C & E give moisture and emolliency to the lips. 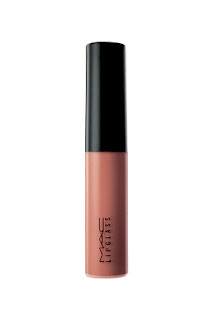 Translucent high shine colour adheres to the lips due to a gellified system. This lipgloss comes in a clear vial with brush. I have my new look done, and I want to give a big thanks to Minx( Kathy) of A Minx By Any Other Name Blog ( link in list) for all her help and work on this. She did a fantastic job, and I appreciate it. Minx- I wish you lots of Montales, Bond9s and L'Artisans. 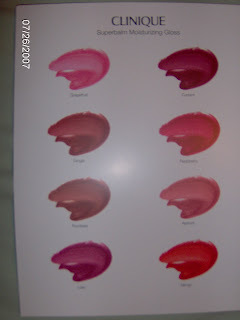 Beginning in August Clinique is launching a new line of their Superbalms, called Superbalm Moisturizing Gloss Lipgloss. I have been a fan of the original Superbalms for a long time and love that this new line has more colors , including deeper ones than before. The new ones are in larger tubes, are very shiny, and have many moisturizing agents like lipids, Vitamin E, and Aloe Vera extract to really help conditon lips and keep them from drying out. There are 8 shades altogether, swatches pictured. They range from very sheer to deep. 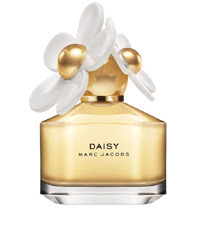 In October Marc Jacobs newest fragrance Daisy comes out. I enjoy both Marc Jacobs original and his Blush fragrance. The original with it's Gardenia is especially nice. "The sparkling floral bouquet opens on notes of wild strawberry, violet leaves and red grapefruit, leading to heart of gardenia, violet and jasmine petals. The base is a blend of musk, vanilla and white woods. " A safe fragrance to be sure, but still it sounds not bad. It will be in EDT and shower gel, cream and lotion. 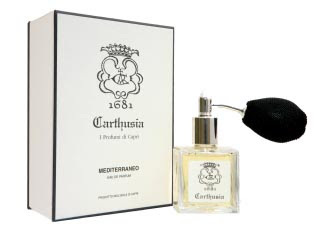 Carthusia is an Italian fragrance company located in Capri, making lovely scents reminiscent of that beautiful place, and perfect for the summer warmth. The notes for these old perfumes were rediscovered in 1948 at the Monastery were they were originally created, and permission had to be secured from the Pope to begin making them again. I have only tested 2 and like them both a lot, but Mediteranneo is my favorite. A bright ,clean , lemon citrus, it sparkles. A most refreshing scent to wear and enjoy through the hottest days. Besides the lemon, there are notes of green tea, but truly, it's the zesty lemon that comes through. Aria de Capri is the other I have tested. It is a very elegant, ladylike scent. Notes of mimosa, iris jasmine, peach and bay leaf. To me it smells a bit powdery, with much of mimosa and iris notes being foremost. It is not overly floral, or overly fruity, just quitely nice. Sillage is medium and it has great lasting power in the EDP. I have not tried the EDT. All Carthusia's come in EDP and EDT. The bottles especially the EDP with their atomizer are lovely, and packaged by hand . Carthusia perfumes are not the easiest to come by, and are carried by beautyhabit.com, c.o bigelow online and at Takashimaya store in NY. I believe Bendels also carries it in NY. The other women's scents are Ligea, Fiori, and IO. If you want a unique and lively scent try this line. 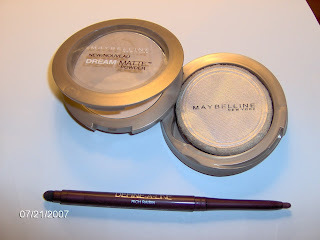 In late June Maybelline introduced new Dream Matte Powder. I am a fan of all things mattifying, and needed to try this. Maybelline has really been stepping things up lately, and this product continues the good run. It is very mattifying, one quick touch of the puff and you are matte. I love it. It also comes in 8 shades, so you can match it to your skin tone. The powder is very soft and light and according to Maybelline is jet -milled into ultra fine particles. The powder also goes on really well, does not settle into lines, get cakey or look bad on the oily spots. It also lasts pretty well too.A neat part is the bottom compartment that swivels out and holds the puff. Instant Age Rewind Double Face Perfector- This is the one new product I haven't officially tried and tested yet. It looks wonderful, though. A concealer on one end and a highlighter on the other. Meant to offer concealing and brightening in one great package. 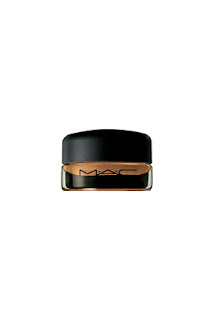 The concealer is a sponge wand and creamy. The highlighter is water based and and a brush applicator. Retails for 8.99 and comes in four shades. 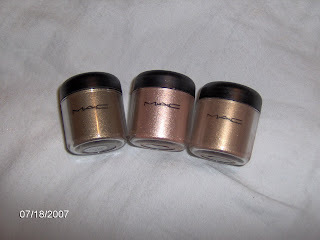 I have seen and tested the Flashtronic and Rushmetal collections from MAC. One word- Run, as in run to your nearest counter . Wow. 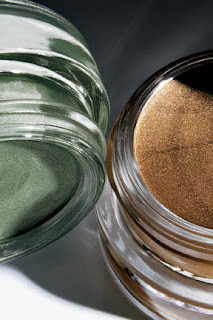 Flashtronic is all Mineralize eyeshadows, Skinfinishes and Lipglass. The shadows especially are little works of art. These are limited editions, so scoop them up while you can. They have such a beautiful mid -sheer metallic look, and I used all products today on eyes , cheeks, and a Rushmetal lipstick, and it looked so great. Even with the shimmer it was fine as I used a light hand with them. The blend seamlessly and just look gorgeous. 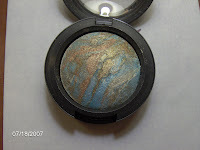 Personal favorites are Quarry eyeshadow, which looks like a verdigris patina( pictured), Tectonic eyeshadow, a antique golden olive, Northern Light Skinfinish a medium gold rose and Frenzy lipstick from Rushmetal, a metallic rose-gold-bronze. However, there isn't a dud in the mix. Gold Mode and Copperized. There are 8 pigments altogether. They coordinate with some great lipsticks. An eye shader brush number 239 is being promoted with Rushmetal also. I am a longtime fan of MAC brushes, and this is a good one. 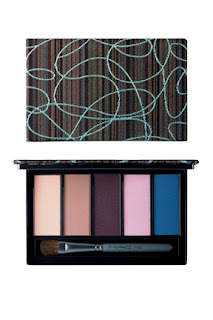 It works wonderfully with the eyeshadows and pigments. Flashtronic and Rushmetal were on counters as of yesterday. Estee Lauder will launch next month Resilience Lift Extreme Ultra Firming Creme Compact Makeup SPF15. I am a fan of compact makeups, but, as mentioned in other posts, anything moisturizing usually won't work on my skin, especially at this hot time of year. However, this looked really nice in the compact and I wanted to give it a proper test. I am so glad I did. It is a wonderful foundation. The official release states that it gives more lift, more moisture, more radiance , and has among other ingredients, collagen boosters. The foundation has medium to full coverage, and gives a bit of a dewy look, but in no way makes your face shiny. Somehow my skin actually looked better, glowier. It lasted very well, and went on smooth and easy, and is super lightweight.I swear , the next day my actual skin was smoother. I love the portability and the ease for touch ups with this as well. I am not sure that I will keep using it now, but come cooler weather, it will be a staple ( of course The Alchemist's mom has designs on it as well). 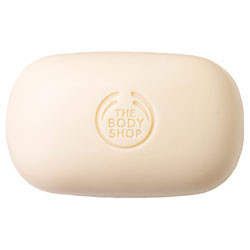 We all love the luxury of a beautifully fragrant bar of soap so much so that The Body Shop alone sells more than 14.5 million bars in over 2,200 stores across 57 countries worldwide every year. But who would have thought that buying a simple beauty bar could be so important in affecting the livelihoods of millions of people in the less developed world? This is all a result of the production of palm oil used in many cosmetics and toiletries, sourced from Indonesia and Malaysia where clearance of the forest for palm oil plantations has increased six fold since the mid 80s, and is still rising. The Body Shop felt the need to do something about this, and as a result has sourced the first supply of sustainable palm oil from a plantation in Colombia. The great news is that all of The Body Shop soaps will now contain sustainably-sourced palm oil. This switch, now offers hope for the future of endangered species and a strong belief that the loss of communities can be prevented. Via the move of The Body Shop to the sustainable option, the company is making strides to improve environmental conditions with the implementation of an internationally accepted set of criteria and certification for palm oil within the beauty industry. So the next time you step into a store and buy from The Body Shop’s array of sweet-smelling soaps, you can be secure in the knowledge that not only will your skin be clean and delicately scented, but you also could be helping to protect the world’s ancient rainforests and their ecosystems, as well as many endangered species that are facing extinction. And if others follow the lead of The Body Shop, sustainable rainforests could literally be in the palm of our hands. The Body Shop’s soap retails for $3.50 and is available in all retailer stores and on the internet at www.thebodyshop.com. I've been testing 2 of the L'Oreal Professional lines Playballs. I saw these sometime back in a magazine and have wanted to get my hands on them ever since. First off is the cute rubbery ball like container. Then there is the product itself. 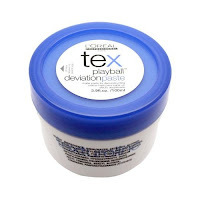 Deviation Paste is a matte finish styler with kaolin clay in it among other things. Goes on dry hair to get piecy style. Just for me. I love it. I have to watch the styling cream/waxes for oily ingredients like beeswax etc. This has none of those. It did make my hair a little oilier but very little. It does , however, give great piecy looks, has decent hold and goes on really nice. It defines and doesn't look shiny or greasy. It is also easy to brush through, if you need to. This is a keeper. Beach Creme is more for tousled hair. It goes through and gives some definition and bit of an unkempt on purpose look that the beach waves give you. Not too much lift, but it's not really for that. When applied. it does look nice and would work well on all hair. I like this one too. One other product I have tested also is the L'Oreal Professional ( serie expert line) Shine Blonde Mousse. I really like this and am not always into mousse products. It is a light conditioning and styling mousse for blonde treated or highlighted hair. I have used this for about 2 weeks and along with my Nioxin shampoo, my highlights are looking good. You use this after towel drying. I use it as my after shower leave in conditioner, and it also gives volume. It doesn't seem easy to find these products, but look up a L'oreal salon in your area( check the website), or ask yours about getting the line. Have your stylist try them and then you can buy them if you like. Well I did not have the best trip. I came back earlier this week as I got sick soon after arriving. I saw little, but in what I did there are observations and things to buy, so here goes. I did get to meet Claude Marchal, founder of Parfums MDCI. He and I had emailed earlier in the year and he seemed a delightful man, and he was. Super sweet, as was his wife. He was thrilled to present his line in person to us, and he remembered my blog. He hoped the fragrances lived up in person to the pictures and they more than did. The bottles are beautiful. 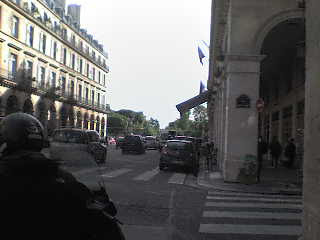 The much lauded perfume shop on Rue Castiglione -Catherine is a bust. It is small, with a basic selection mostly. Nothing out of the ordinary and only slightly lower prices. They also use a hard sell. No one who went in was impressed or purchased. The duty free shops at Charles De Gaulle airport are equally a bust. Heathrow has a mall, Charles DG has closets. Again not a great selection and no great savings. 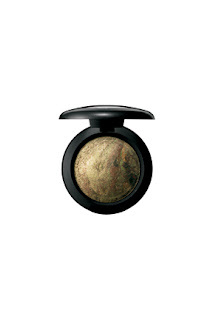 The duty free only makeup compacts are very nice as is the Emerald Dream fragrance by Estee Lauder. If you want to really look Parisienne, get a Longchamp bag. Almost everyone was carrying a Le Pliage bag. I almost caved on one at the airport. They are very well priced ( 66 Euros, which is about 85.00) but I decided I wasn't that into it. I would prefer longer handles. 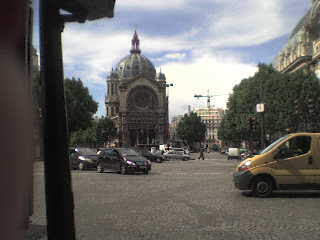 Such as it, thats my Paris report. I will have lots of reviews coming up. 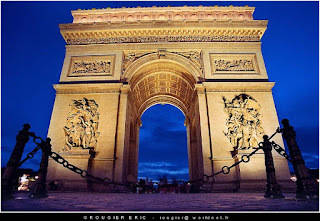 I am leaving for a week in Paris, so no new posts until July 16th. Have a great week, and I will have much beauty news I imagine as I will be stopping at many pefume houses. New and coming from MAC- above Novel Twist Lip and Eye Palettes, Mineralize eyeshadow from Flashtronic, below Lipglass from Flashtronic. Rushmetal bows July 19th, Novel Twist July 20 and is available for pre order at Nordstrom, Flashtronic September 27th. 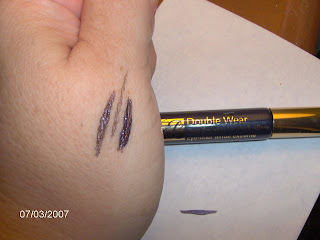 One of Estee Lauder's new Fall products is Double Wear Zero Smudge Liquid Eyeliner. I mentioned this in an earlier post, and have now tried it. It comes in 2 colors, A black brown called Midnight, and After Hours, the one I tested and love, a deep purple. This liner has a vey small tiny brush for precise application and goes on nicely. I ran some lines on my hand to show the color, but in order to do that I made them thicker than what the liner does normally. The middle line shown is closest to what is goes on like size of line wise. The color goes darker. The color is deep ,rich purple, that has some shimmer. I got about 6 hours lasting time out of it, and even though it's said to last longer( 15 hours), on me thats pretty good. I can wear down most eye makeup fast. I really like this, and think it's one of the best fall products from Estee so far. It will be in stores in August. 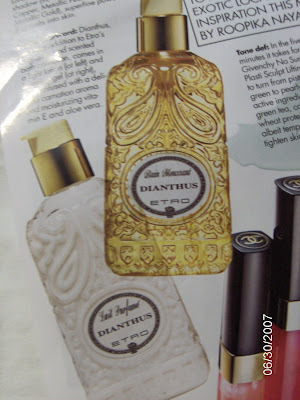 The new issue of Elle shows the shower gel and body milk coming out for Etro's newest fragrance Dianthus. I have not yet smelled this and have not loved but liked the few Etro I have tried, but these are so pretty , so not your run of the mill shower gels,and just need to be sat out in the bathroom. They also come in other scents. Bergdorf Goodman carries Etro, but Dianthus is not yet listed on the website. Vicolo Fiori: A delicate, feminine tribute to the first Etro shop in Milan. Mandarin-flowery top notes, fruity-flowery middle notes of wild rose and water lily, and woody-ambered base notes. Each, 8.25 ounces in an engraved bottle with pump.